As one of the original homes in the Huntington Tract, this 1928 Spanish Revival was in need of a real California garden to complement its California native owners. 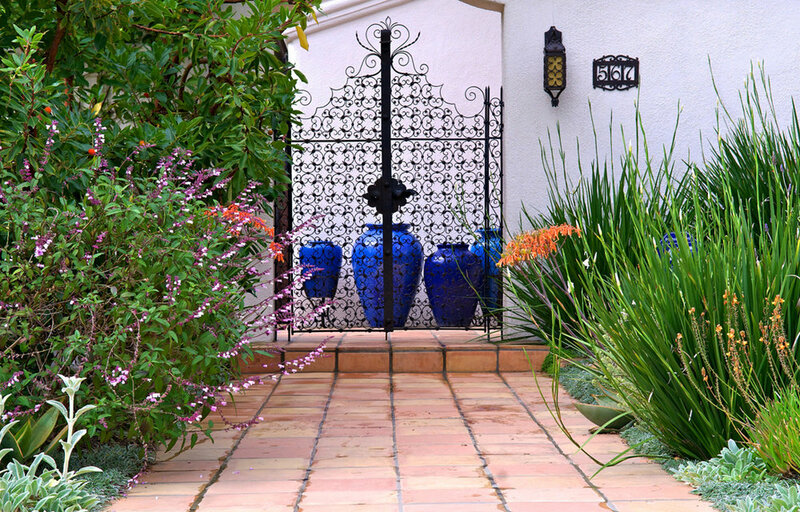 Staying true to the authenticity of the house, our design for the front garden utilizes a classic Mediterranean plant palette mixed with California natives as well as old-growth olive trees to create a meadow-like feeling while still acknowledging the classic garden order of the surrounding neighborhood’s gardens. Originally composed of just a lawn, a few plants and a lone Jacaranda tree, we removed the lawn; we then introduced old-growth olive trees, California and Mediterranean flowering shrubs, perennials, annuals, grasses and bulbs. Our intent was to create more visual interest with an authentic garden that spoke to the roots of the house. The diversity in combining California native and Mediterranean palettes furthered this goal. In place of a turf lawn, we planted a pseudo-meadow of California meadow sedge (Carex pansa) in the parkway and under the olive trees, annually seeded with poppies and planted with bulbs. The back yard needed definition as a play courtyard. Having installed a new swimming pool a few years before, the goal was to marry the naturalistic pool with the formality of the stucco walls and create a lawn to be used from corner to corner. Adding focal points like spilling pot fountain and an herb window box, gave the space more life. All irrigation zones except for the lawn were converted to drip, for maximum efficiency. The completed garden spaces reflect the constantly changing nature of the Santa Monica Mountain hillsides while maintaining a formal garden style, in keeping with the surrounding traditional neighborhood.